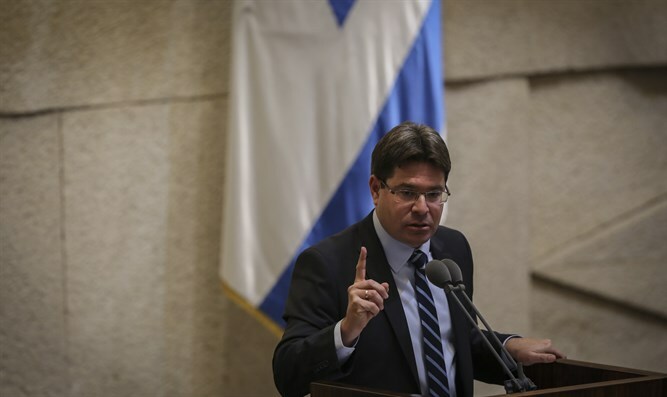 Science and Technology Minister Ofir Akunis today (Tuesday) wished success to Prime Minister Netanyahu ahead of his meeting with President Trump, calling the president "pro-Israeli and friendly." In his speech at the 14th Jerusalem Conference, Akunis harshly attacked the "two-state solution", saying that he opposes the establishment of a Palestinian state. "Tomorrow our Prime Minister Binyamin Netanyahu will meet with the President of the United States, a friend of Israel, Donald Trump. To my great satisfaction, and I am sure also to yours, a new, friendly, pro-Israel American government was elected. To my mind, they are also brave and uncompromising, and therefore of course, I send them my blessing," said Akonis. He said that new governments may continue clinging to old ideas, fueled by Israeli sources, and not necessarily the extremists among them, "guided by the idea of ​​dividing the country and establishing a Palestinian state alongside Israel. It will not happen. "The State of Israel is humanly indivisible; it was not bequeathed by mortal hands, its borders are not negotiable; dividing it would be unthinkable. One may and must develop all its territory, expand, take care of infrastructure, build roads, raise children, and plant trees. Israel in its entirety is the country of the Jewish People, and the right to it belongs only to the Jewish People," stressed Akunis. This right, said the Science Minister, is eternal and irrevocable. "This is an acquired right. It is an historical right. It is enshrined in the Book of Books and in all history books, studies, and findings. It is anchored in every excavation under the Temple Mount, next to the Temple Mount, and south of the Temple Mount." Akunis says that few nations in world history have had a protracted and firm connection to their historical homeland. "Few are the nations willing to give their lives time and again for a plot of land. Few are the people who lived 3,000 years in a row in their historical homeland, mostly under occupation by other nations or distant empires. "But there is a Jewish People who came from the land of Judah, from the kingdom of Israel, and from the eternal capital, Jerusalem. The Regulation Law debate took place a week ago in the Knesset - the debate was not about the law, but about a question, perhaps the most fundamental question about the future and direction of the Jewish people: Whose country is this? Ladies and gentlemen, I promise, as I have done since my first day in public life, to remain disinterested towards this way or another, but to remain steadfast to my ideological position: As long as I'm part of the Israeli government, I will work with all my strength against the surreal and dangerous idea of dividing the country, and even if I remain alone, I will always vote against the establishment of a Palestinian state no matter what costume is used to define it or seeks to promote it. "Conceding the existence of a Palestinian state means condoning Israel's demise. Not on my watch. Not on Jabotinsky and Begin's watch," stressed Akunis. He noted that last week's regulation law is another step in realizing G-d's promise to Abraham: "I will give it to you and to your descendants forever." Akunis recalled the statement of the mayor of Silwad, close to Amona, that "you should go back to Europe." According to Akunis, "It is the foundation of the argument. The nucleus. Not about blocs or removal of this or that settlement. The debate is not about Amona. The debate is not a tactical-territorial dispute. What that Palestinian said, Mayor of Silwad, is actually the basis of the Arab-Israeli conflict for the past 120 years. "Let me tell you a secret: They don't care about Amona, nor Yitzhar, nor Ofra, nor Shilo or Eli. What interests them is Jerusalem, Tel Aviv, Ramat Gan, Haifa, Lod, and Ramle. They are interested in seeing us across the ocean. So let it continue to interest them. And, if the second option is to forever live by the sword, then we shall forever live by the sword. Proudly, confidently, and in our own country."